Anyone with a passing interest in asbestos will know its basic history: the start of the mineral's exploitation in the late 19th century; the first knowledge of its toxic health effects in the early 1900s; the growing problem of asbestos-related cancers after the 1950s; the battles between campaigners and the multinational asbestos manufacturers in the last decades of the 20th century; and the ultimate banning of asbestos in the EU (and other countries worldwide) by 2005. In Europe and North America, one can perhaps entertain the notion that the battle against asbestos has been won  a victory apparently underlined with the recent withdrawal of Canadian government support for its indigenous asbestos mining industry. However, this paperback volume shows that such a view would be complacent. Asbestos use has not been banned globally (in some countries, asbestos usage is actually increasing); mesothelioma rates continue to climb, even in the EU; and banning manufacture is not the same as banning exposure, since buildings everywhere remain contaminated with asbestos. Internationally, asbestos lobby groups which peddle the 'chrysotile is safe' myth are as active as ever. Even within the EU much remains to be done. 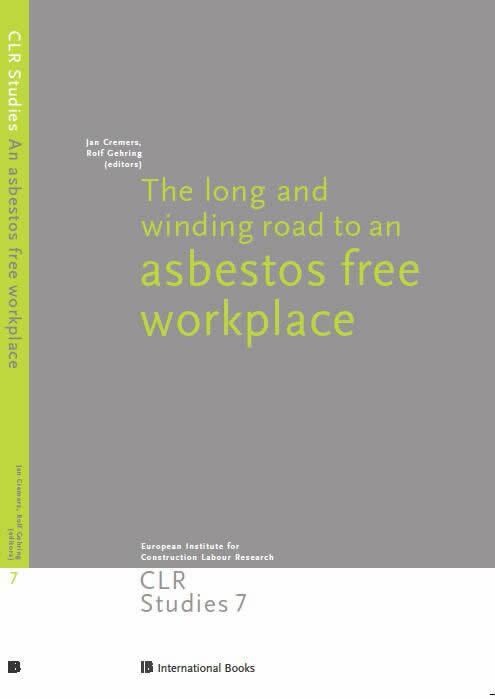 The research presented in this book began when the European Institute for Construction Labour Research (CLR) was invited by the EU Parliament to document asbestos policy worldwide and also collect data for a future EU strategy. This is a summary of the findings by CLR and its associated experts. It is divided into three parts: the fight against the use of asbestos; the free trade of construction products and workers' health; and perspectives and future challenges. the problems are more or less the same'. Enforcement of safety regulations remains a huge problem, particularly involving asbestos removal and waste disposal; and so does market surveillance over continuing imports. Laurent Vogel provides a detailed overview of the international asbestos industry, with useful data on asbestos production between 1900 and 2000. It may come as a shock to discover that the present tonnage at over 2 million tonnes is not much different from 1960. Vogel charts the shift of the global industry from North America and Europe to the developing world, but although the locales changed the manipulation of scientific data to give asbestos a clean bill of health remained a constant. Vogel shows how the lobbying baton has passed from Canada to the new asbestos industry leaders in Russia and Asia. In Part Two, John Calvert considers Canada's role in detail. It is a story that has been told before, but it is worth restating this extraordinary saga: how an advanced industrial economy became a global cheerleader for a highly toxic mineral, thereby facilitating its sale and production in developing nations, while shunning its use at home. This chapter focuses on Canada's efforts to block international efforts to ban the mineral  particularly that country's role in the obstruction of the listing of asbestos as a hazardous material under the terms of the Rotterdam Convention. It also looks at the role of trade agreements in the banning of asbestos, especially the implications of Canada's failed challenge at the WTO to the French asbestos ban. Calvert believes that a global ban is now possible, but also notes that the coalitions that have helped bring a global ban closer (trade unions, victims' groups, public health officials, and international agencies such as the WHO, EU, and UN) are less influential in Russia, Kazakhstan, China, and Brazil. As Gerd Albracht shows in a German case study, a range of trade unions and agencies attempted to counter industry lobbying organised by Eternit, which in the 1980s blocked government regulation. These bodies included IG Chemie, IGM, IG Bau-Steine-Eerden, TV, the DGB (German Confederation of Trade Unions), the ETUC, the German Lnder and the Federal Environment Agency. In 1981, a conference organised by IG Chemie stepped up the fight against asbestos by calling for a phased asbestos ban. This was rejected by government, but it is argued that trade union pressure and works councils led to Eternit moving quicker than planned to asbestos-free materials. The slow move towards banning asbestos, though, had a disastrous impact: in Germany, three-quarters of work-related cancers are related to asbestos; and the majority of cases receive no compensation. A common denominator in the history of European asbestos is the multinational company Eternit. Maria Roselli takes us to Switzerland, which was the heartland of Eternit. It was the HQ of the Schmidheiny family, which owned the core business. In the company's heyday, it employed 23,000 in at least 16 countries and dominated the manufacture of asbestos cement. Eternit's influence meant that in Switzerland an asbestos ban did not appear until 1990 for building construction and 1994 for underground engineering (pipes). Eternit's power is evidently not what it was: a recent Italian prosecution of Eternit and Stephan Schmidheiny, which began in 2001, ended in 2012 with the court handing down a 16-year jail sentence for Schmidheiny. But that is scant consolation to the 2,000 victims of asbestos-related disease and the 800 others who have been seriously affected. While company influence has waned, the trade unions have become stronger and more adept at influencing government policy. Fiona Murie looks at the response of the construction trade unions. It took twenty years from the mid-1980s for the trade unions to recommend a ban on all asbestos. But in 1989, delegates of the International Federation of Building & Wood Workers passed a resolution calling for a global ban. In 2000, IFBWW launched a new Global Ban Initiative and also forged links with other bodies, such as the International Ban Asbestos Secretariat. The unions increasingly took up the cudgels to fight the propaganda about 'safe use' disseminated by the Chrysotile Institute in Canada; and also to urge the listing of chrysotile as a hazardous substance under the Rotterdam Convention. The Building & Woodworkers International (BWI)  the successor to the IFBWW  now intends to target the remaining asbestos producing areas and replicate previous strategy by increasing trade union pressure, countering industry propaganda, and supporting victims. It will convene the next global asbestos conference in 2014. Part Three of this book provides perspectives and looks at future challenges. Laurie-Kazan-Allen explores the dynamics in the new century, with a detailed review of present (and past) production and consumption; the dirty tricks of the asbestos lobby; and the increasing political mobilization of asbestos victims. Although compensation in many countries remains low, it is evident that the international ban asbestos movement can claim many successes: a string of international conferences and publications, the mobilisation of Ban Asbestos Activism in Asia after 2004, the Italian trial of asbestos executives, and the Asian Solidarity Mission to Quebec in 2010. Rolf Gehring's chapter shows that the impetus within the building workers' unions has not slackened. In 2010, the European Federation of Building & Woodworkers (EFBWW) launched its asbestos campaign at the European Parliament. Its target is to remove all remaining asbestos in Europe by 2023. Gehring assesses whether this can be achieved. In a volume of this type, some overlap is inevitable. A list of abbreviations and an index, which would have been helpful, are lacking. But it is packed with useful information and can be recommended to anyone who needs a handle on recent events in a single volume. It is presently the most up-to-date publication available on global asbestos. A number of themes emerge, particularly the baleful influence of Canada and the slowness of industry, government, and (in the beginning, it must be said) the trade unions in moving towards a ban. However, victims' groups and the construction workers' unions fought back strongly after the 1980s and succeeded in forcing the industry and governments onto the defensive. The main message of this book, though, is that bans and regulations mean nothing without enforcement and continued vigilance. The survival of the asbestos industry in countries such as Russia, China, and India is another depressing feature that emerges in these pages. 'An asbestos-free future is possible', writes Laurie Kazan-Allen, but this study is a reminder to everyone that this will only happen if the fight against asbestos continues. US and Canadian orders to: IPG books, frontdesk@ipgbook.com, or phone tollfree 800-888-4741.